Basically I started out picking up a bag of hooks in the “These look like they should work OK mode”. I didn’t really understand what the hooks were for besides getting stuck inside the mouth of a bass if I was lucky. I spent a lot of time experimenting with different styles, read a lot, and spent a lot of time in the trial and error phase. If I knew then what I know now, I would have saved a lot of cash on all those hooks that I don’t use much anymore. Anyway, the idea came to me that someone new to bass fishing might like to get a little peek inside my tackle box and see the three basic styles of hooks, and the three sizes that I now use almost exclusively. I have boiled it down to nine hooks. Three primarily for dropshots, three primarily for Carolina and T-rigging, and three primarily for grubs, tubes and bulkier plastics. The important word here is PRIMARILY. As you will see, depending on what type of lures you are using, an almost endless number of combinations of hook and lure presentations can be achieved with these nine basic hooks that I now use. There are three Owner Mosquito Dropshot hooks sizes 8, 6, and 4. Note that in the smaller size dropshot hooks they get smaller as the numbers get bigger. Next we have three Extra Wide Gap (EWG) offset shank hooks sizes 1/0, 3/0 and 4/0 For this group the hooks get bigger as the numbers get bigger; which I use for larger bulkier plastic worms, grubs and tubes. Finally we have three offset shank “J-Bend” worm hooks, sizes #2, 1/0, and 3/0. Great hooks for Texas Rig andCarolina Rig. I use the dropshot hooks with different sizes depending on the lure. For the most part I use smaller worms, 4.5” and 3” so the number 8 is my favorite. I do know many fishermen who prefer the size 6 or 4, but I have found for the smaller dropshots you get better actions with less weight on the nose of the hook using the number 8. Plus, if you are into Catch and Release like I am, the smaller hooks make it a little more challenging and do a heck of a lot less damage to the fish when the hooks are removed. You may be thinking “Dang! A number eight. What is that guy doing…trout fishing?” Trust me, the number 8 works great when you’re fishing with small lures, and I have landed many nice bass using them. The following photos are all showed rigged up with the number 8 on a 4” BPS Quivering Tail Dropshot Minnow. The first method shown in full length (above) is the nose hook method. On larger lures, such as this seven inch ribbon tail worm (to the left), I like to use the 1/0 EWG hook with a heavy 1/2 oz. egg sinker for a dropshot weight. This allows for long distance casting into deep water from the shoreline. Also for the dropshot I sometimes use the #2 offset shank worm hook for lures like this six inch lizard(to the left). For these two I use the offset shank j-bend hooks in sizes #2, 1/0, and 3/0 depending on the size of the lure and how fast I want it to sink. These hooks are also great for trick worms and craws. For the T-RIG WEIGHTLESS grubs I use the larger EWG hooks like the number 3 and 4 for fat bulky lures like the Fat Boy Ika. The larger size hooks add some extra weight to these for longer casting and faster drops. 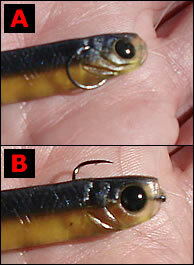 To the left you will see a typical Texas Rigged worm on a J-Bend Hook. The weight on the nose of the worm shown here is a Bullet 3/16 ounce screw in type. For the T-RIGGED WEIGHTLESS TEX POSED using the 5” Senko I like to use the 1/0 offset shank (J-Bend) worm hook and thread it all the way down to the middle of the worm for a nice horizontal fall. Fat 4.8” Keitech Swing Impact lure (shown below) and also larger tubes. Hook sizes and numerical designations vary from one manufacturer to the next. Also, hooks come in different colors, like “bleeding red” for example. If you have to make a choice of one color I suggest going with black chrome (also called Black Nickel), if it is available. I’ve had the most success with those. If you are on a limited budget (and who isn’t these days?) you could easily get by with the Owner #6 for dropshot, the 1/0 offset shank j-bend worm, the 3/0 EWG worm hook for starters (the middle sizes). Or better yet you could join up with two friends and co-op for the nine bags of hooks and split them up. Although, this approach might take a little bit more socialization skill than most fishermen that I know have. Take it from CAPTAIN HOOK, give some of these ideas a shot and you’ll be getting hooked up with some really nice bass in no time. And don’t forget to experiment with different lures, setups, weights, lines etc. After all you can dropshot just about any plastic lure. Do you know the basics of worm fishing? Well you should… Arguably one of the most productive baits on the planet is the plastic worm. Whether you fish it on a Texas Rig, Carolina Rig, Drop Shot, Florida Rig or on a Split Shot Rig you can almost always catch bass on a plastic worm. The plastic worm is a very simple bait to learn to master and hopefully after reading this article you will feel more comfortable and confident in your ability to produce a limit while using it. Since this is designed to be a basic instructional guide for the plastic worm I am only going to get into basic rigs and techniques. We bass angler’s are always looking for new weapons in our ever growing arsenal of tackle. If it is new or different and catches fish, we want one, or two or three…. The tube jig is just such a bait. Although on the market for several years now, tube baits have undergone some changes and are making a big comeback. Denny Brauer, last year’s Bassmaster Classic champion, brought the bait back into the spotlight following his victory using tube baits. The original tube jigs were 3″-31/2″ long. The new tube jigs are 4″ plus and are bigger in diameter than before. They come with salt impregnated in them and in a variety of scents to enhance their fish catching ability.